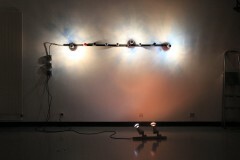 Nicholas Vargelis is a visual artist working in various mediums and is based in New York City and Paris. 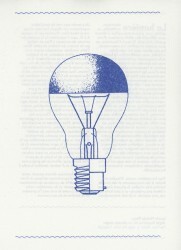 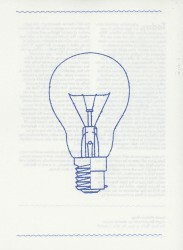 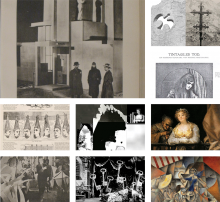 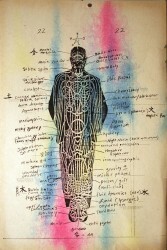 Nicholas' work combines various contemporary practices -- social organization, technological development, narrative histories, the iconography of forms (such as the history of the light bulb), with the artist as trickster or "situation inventor" who alters contexts to provoke different orders of thought. 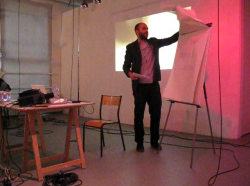 Nicholas' practice is often collaborative and is, above all, influenced by a social network of artists, writers, architects and other thinkers. 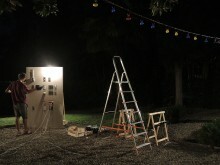 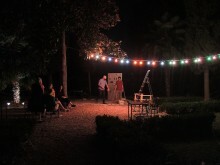 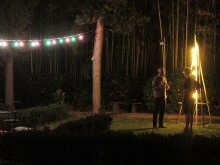 Part light installation, part performance this work takes place around a large villa in Italy. 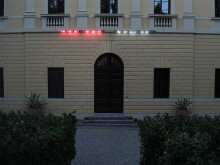 On the façade of the villa a flashing display of colorful electric light acts as an announcement or preview for the installation and performance. 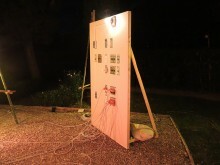 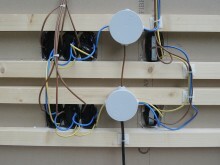 In the garden on the opposite side of the villa, a wall made of plaster-board contains a control panel of light switches and outlets forming a constellation of circuits mimicking a theatrical lighting control system. 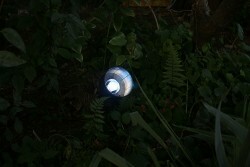 Scattered around the garden are lamps assembled from common electrical materials. 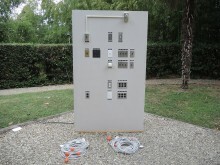 The electrical infrastructure is a hybrid of German, French, Italian and USA standards — electrical goods are imported from the USA (following in the footsteps of “developmental help” policies) and combined with European parts. 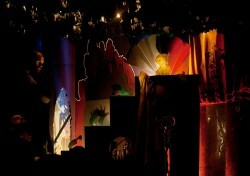 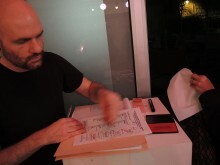 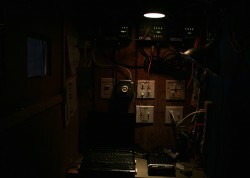 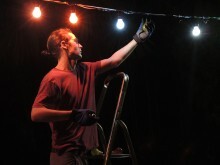 The performance revolves around a dialogue of two lighting technicians making a light show for a non-existent theatrical performance as they execute various lighting scenarios following a pre-scripted scenario creating illusions of light and at the same time revealing the inherent hierarchies of the working process in a theater. 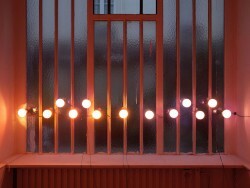 The manipulations and variations of light in the garden function as an attraction or diversion: pointing to an awareness of light as architecture. 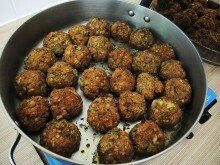 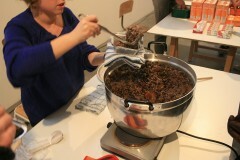 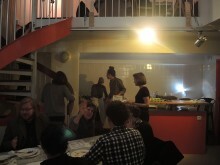 Augustin Grenèche, Sarah Tyler and Nicholas Vargelis make a functional cafeteria serving cheap gourmet food. 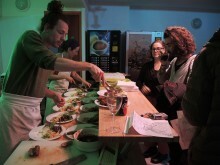 The three collaborators perform the various roles of the cafeteria: a sausage cook, a vegan cook and an administrator/ cashier. 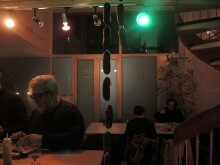 The cafeteria presents the sausage menu and vegan menu as exclusive culinary paradigms in a colorful mise-en-scène realized with a dynamic lighting installation. 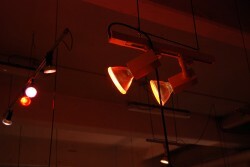 Through scripted roles, the three workers of the cafeteria interact with customers playing with coercion, implementing various rules, show of authority, control of bodies, distribution of food and the manipulation of atmosphere through electric light. 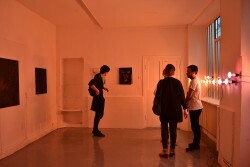 Furthermore, the work embraces both the exploration of human relations and their social context, while at the same time also hints at a theatrical situation that follows pre-determined situations. 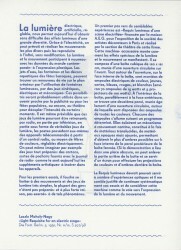 The French title “Jeux d’Eau” is translated as water jets or can be literally translated to mean water games. 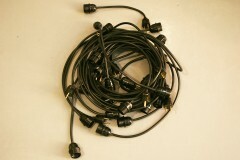 The installation consists of garden hoses and water sprinklers commonly found in suburban yards. 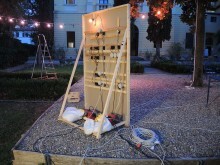 The water jets of the installation form a variety of aesthetic patterns controlled by a central set of valves made accessible for one to play or control the varying constellations of water formations mimicking public fountain displays. 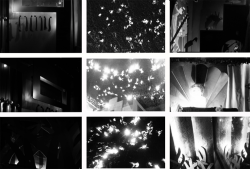 These different setting of the water displays are inspired by the 1953 experimental film "Eaux d'Artifice" by Kenneth Anger, featuring the fountains of an aristocratic garden in Italy. 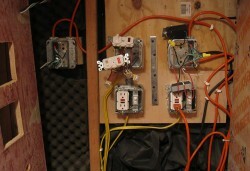 To the right of the sentence three light switches control three different sets of lamps connected to an electrical track suspended from the ceiling. 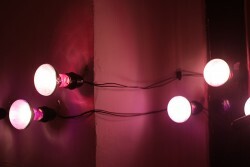 The three sets of lamps correspond to three different technologies: incandescent, fluorescent, and L.E.D. 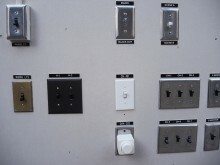 Using the three light switches one can light the sentence with the various lighting technologies revealing the aesthetic differences of what is considered “white” light. 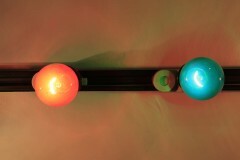 Inspired by the use of colored light in a scene of a well know French Nouvelle Vague film, this video and installation document a colored light bulb intervention at the art center where the artist was in residency for several months. 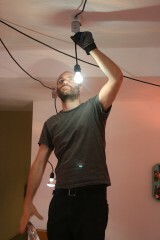 Little by little throughout the duration of the residency each time a light bulb burned out in the apartment, the studio, or public spaces in the building Nicholas would secretly replace it with his own hand-colored light bulb. 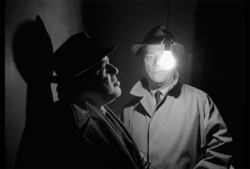 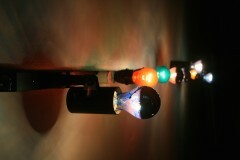 When making the video, cinema lights with colored filters were used to compliment and augment the color of the painted light bulbs mimicking the saturated colors of mid 20th century popular films. 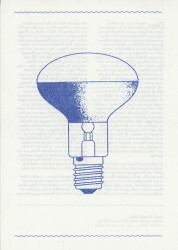 "(When Something's Good It’s Always Good)," Zine, 32 pages, 19 x 14 cm, 2015-2016, two color riso printing. 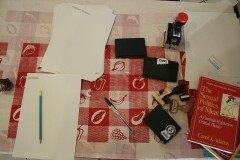 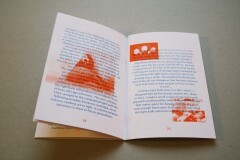 This zine is part travelogue and part critical essay. 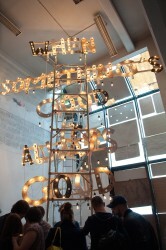 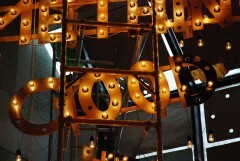 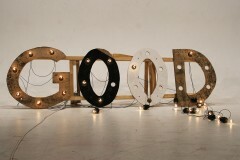 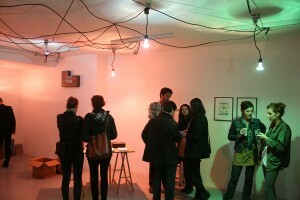 The text uses the electric filament light bulb as an instigator to elaborate on aesthetic and social phenomena. 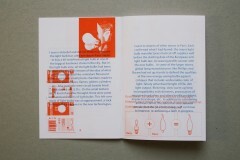 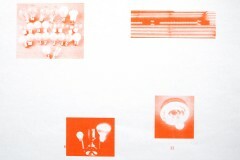 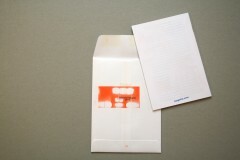 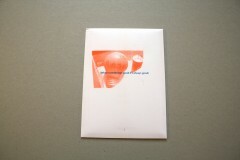 The work was printed in two colors on a 1990's-era risograph printer. 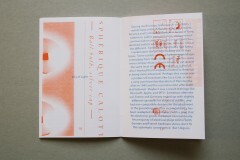 The design of the zine takes into account the limitations of this technology as a chance operation – specifically the near impossibility of calibrating the machine to adhere to the placement of the printed image on the page when using more than one color. 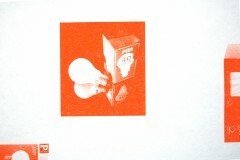 Unlike with laser printing, riso inks are soy-based and slightly translucent allowing for colors to be overprinted. 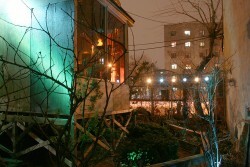 In a community garden in the Lower East Side a lighting intervention takes place. 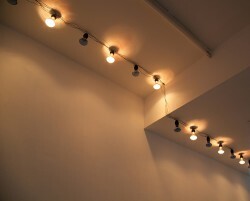 The center of the work is a light string — an homage to the artist Felix Gonzales Torres. 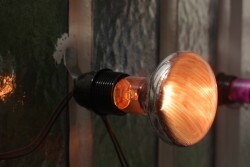 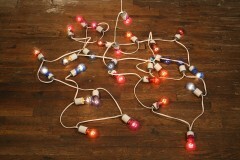 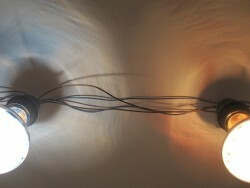 At first glance the light string appears to be an industrial produced ready-made, but closer inspection reveals that it is unique although assembled from standard modular electrical fittings — white cord and porcelain sockets that support a set of incandescent light bulbs, hand painted in various shades of color. 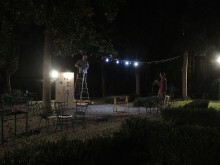 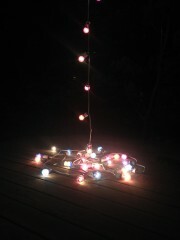 A calculation of energy consumption determined that the garden’s electrical service cannot handle both the light string and the existing permanent garden lighting system. 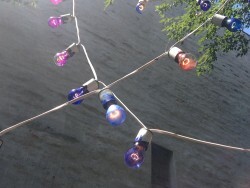 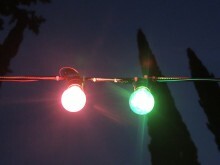 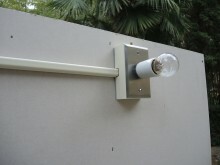 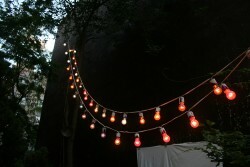 In order to accommodate the light string, the existing garden lighting is modernized with energy saving L.E.D. 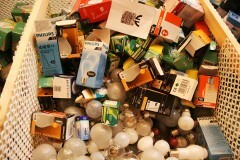 light bulbs. 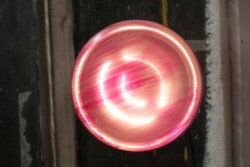 The L.E.D. 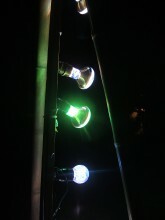 light bulbs installed in various lamps around the periphery of the garden are chosen for their quality to mimic the incandescent light bulb’s shape and burning filament. 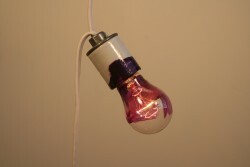 The new L.E.D. 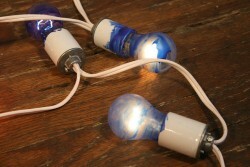 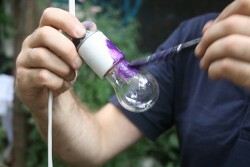 light bulbs are hand painted to mimic the colored effect on the light string. 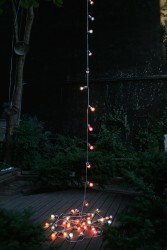 Over the course of several months, the light string’s configuration changes periodically to reflect, highlight, or contrast other cultural events in the garden. 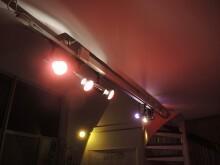 Additionally, a theatrical dimming system is made available, allowing for variations of intensity to to the light string and permanent garden lighting. 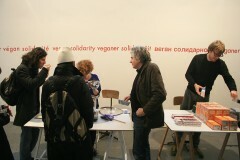 The artist group Et al. 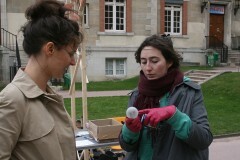 * worked with Colette Lumière (a.k.a. 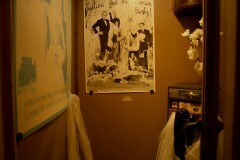 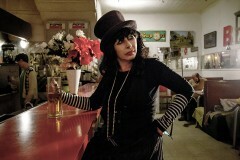 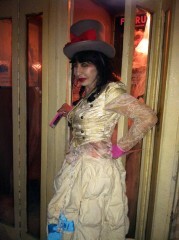 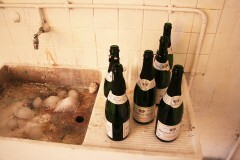 Colette Justine) to recreate her signature immersive environment at the Sunview Luncheonette. 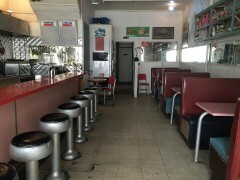 The Luncheonette is an old 1950’s diner frozen in time since it closed in the late 2000’s and is presently used as a project space. 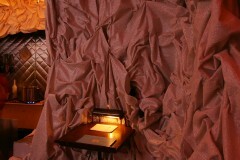 The diner is completely transformed or “Colettesized” through the use of pink silks and other fabrics. 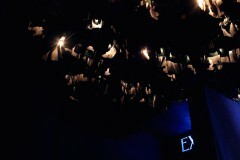 A special lighting installation is made that produces a very dim back- light from behind the many layers of fabric that emphasizes the materiality and layered nature of the work. 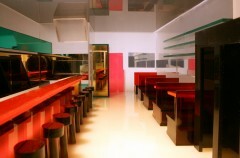 Parallel to the “Colettesization” of the Luncheonette, a scale model of the space is made entirely out of plexiglass, as a further symbolic transformation of the space. 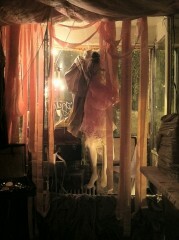 The uniform and angular plexiglass acts as an oppositional force to the installation of silks and pink fabrics. 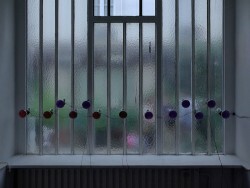 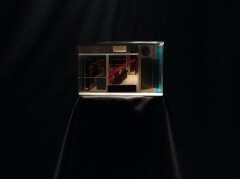 The scale model is displayed in an adjacent room draped in back curtains. 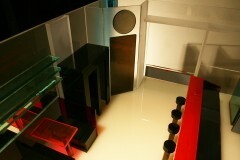 In the center of this space, a single spotlight is focused on the display of the plexi-glass model. 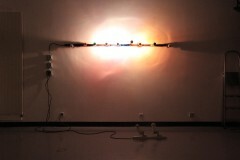 This work takes as a point of departure Dan Flavin’s sculpture ‘Untitled, Jan. 22, 1964’. 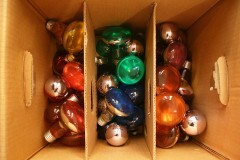 Less of an homage, and more of a ‘correction,’ colorful hand painted incandescent light bulbs are used in place of fluorescent lamps. 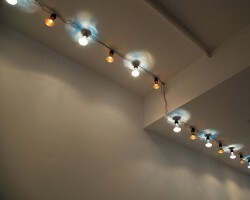 Flavin’s linear dimensions and pattern of varying colors are used but Flavin’s nuances of white fluorescent are changed to a range of warm pigments applied to the surface of the light bulbs by hand allowing for an emphasis on variations. 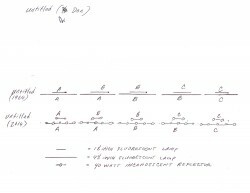 While the Flavin sculpture captures a frozen moment in time (his lights remain continuously lit) here a theatrical device is applied to the electrical installation that turned the lights on for 60 seconds and then o for 60 seconds in a continual loop. 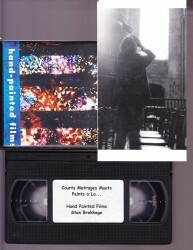 The Bradley Eros VHS archive (or the Velvet Hermetic System) is a collection of over 600 VHS tapes collected by Mr. Eros, a New York City experimental filmmaker. 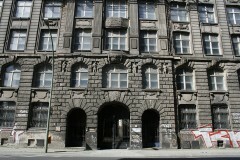 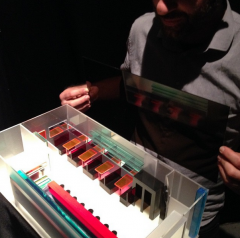 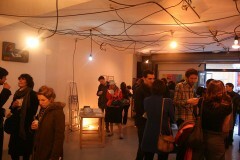 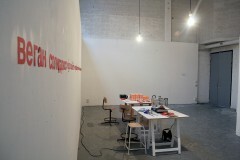 The archive is currently on long-term loan to the Sunview, a project space in Brooklyn. 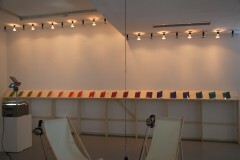 Most of the titles in the collection are from an underground culture of the 1980’s and 1990’s. 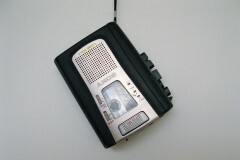 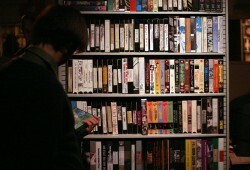 While some tapes were obtained from various movie distribution houses, others are dubs and bootlegs. 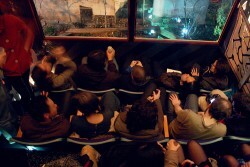 As the collapse of the downtown movie houses gave rise to the suburban home theater, now in the 21st century the activity of movie viewing has moved online. 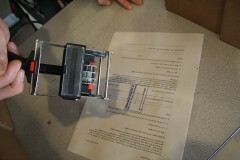 With the personal computer attention moves at the speed of clicks. 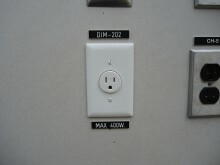 Rarities are decidedly more accessible. 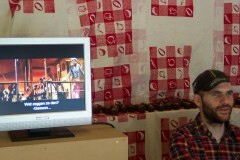 The immediacy of Youtube, Karagarga and UbuWeb have disappeared embodied searching. 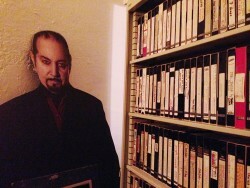 The archive contains a holy grail of weirdness and subversive art collected while Eros lived in Chinatown and the East Village in the 80s and Williamsburg during the 90s. 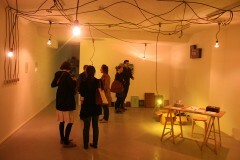 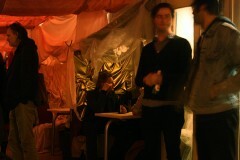 For this project an intervention is made to engage with the entire exhibition space as part of a group show. 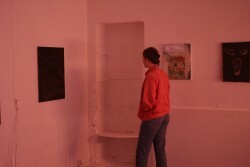 An overarching theme in the show is that of transporting thought and intelligence across space and time. 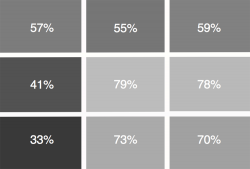 In considering technology and the spirit world a choice is made for an embodiment of light through a theatrical mise-en-scène examining the range of color temperatures seen in consumer lighting technologies (from warm “white” to “daylight” etc.) 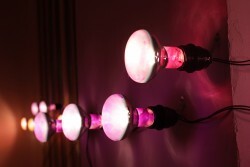 - but instead of using different technologies (such as L.E.D. 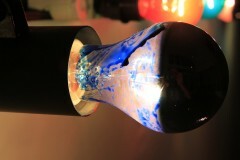 or C.F.L.’s) colored pigment is applied to standard incandescent light bulbs. 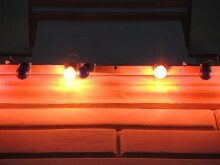 A theatrical dimming system is used to make the room slowly changes from whitish-blue to light-amber and back over the course of several hours. This results in a chromatic shift in the gallery that is only perceived by the viewer if they stay in the room for a significant amount of time. 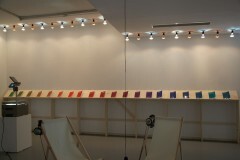 The Blue Balcony is an installation that recreates a grand cinema of 1920’s and offers an abstraction of the expected cinematic experience. 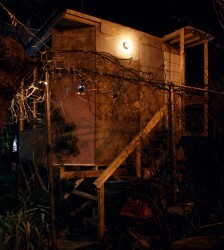 From the outside the sculpture resembles a non-desrcript plywood shack propped up on stilts with a narrow staircase allowing access to the interior. 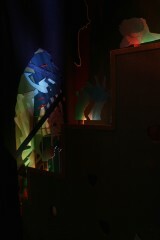 Upon entering the sculpture, one is immersed in a heavily detailed and colorful environment. 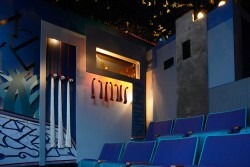 Three rows of cinema chairs and a projection booth all on stepped platforms help to create a sense of height and depth. 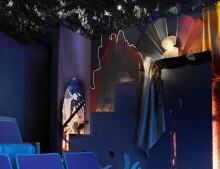 The Blue Balcony references the ‘atmospheric’ movie houses of the 1920’s where the walls of the auditorium resemble a permanent Hollywood stage set with fake building façades under an artificial starry night sky. 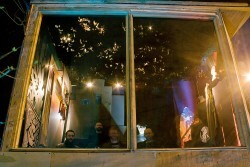 In place of the screen are two giant plate glass windows looking to the outside. 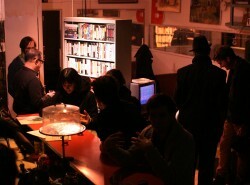 During nightly ‘Sans Screenings’ movies are played with soundtrack intact, but sans image. 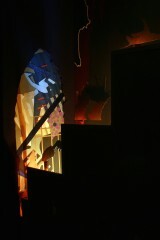 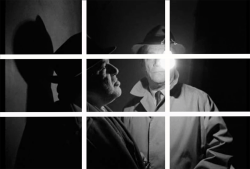 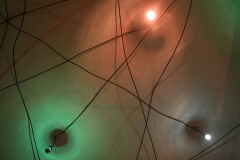 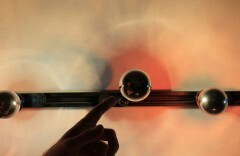 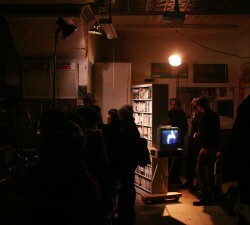 The visual component of the film is nonetheless present as an abstraction of light realized via lighting effects generated by a computer algorithm that analyzes the movie and translates images into values of light intensity. 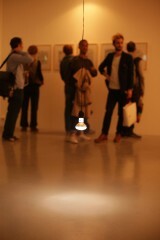 This real-time data is used to control dozens of light bulbs hidden in the decor of the room. 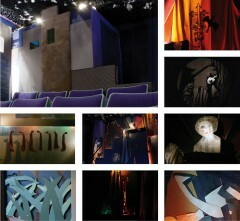 Thematically the balcony alludes to Maurice Maeterlinck’s symbolist fairy tale The Blue Bird, as well as the labyrinth of Louis XIV’s Gardens of Versailles and the 1924 silent cubist film L’Inhumaine, featuring Georgette Leblanc framed by the modernist sets of the French architect Robert Mallet-Stevens. 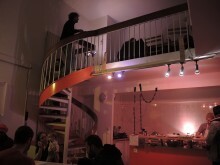 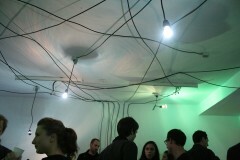 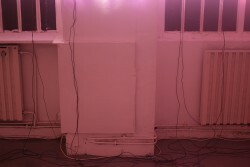 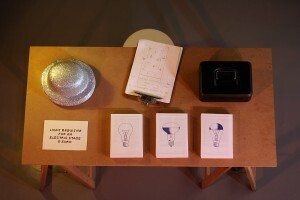 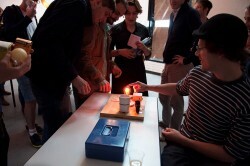 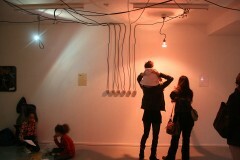 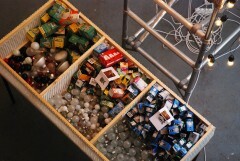 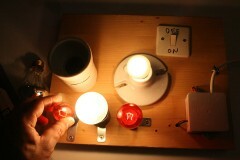 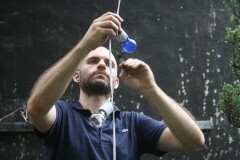 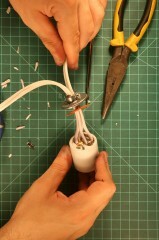 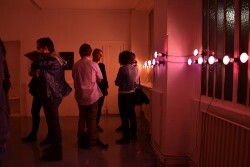 This work consists of two parts: First, a video loop documenting the artist stealing light bulbs in the streets of Paris, turning off the lights in Parisian métro, activating the visible parts of a circuit in the artist’s studio, and the artist installing (in a clandestine manner) hand painted light bulbs in a European art institution . 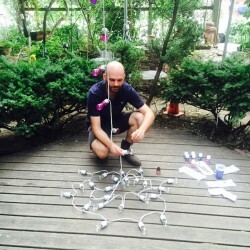 Second: a sculpture made of standard modular lighting parts and light bulbs gathered, bought, or illicitly obtained from diverse locales such as the flea market , various art institutions, various rendez-vous via LeBonCoin.fr, S.B.F. 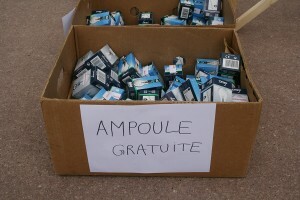 Electricité, etc. 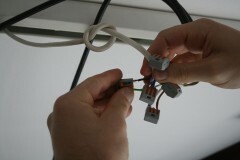 For this installation, an electrical system is installed consisting of outlets, switches, and black cable. 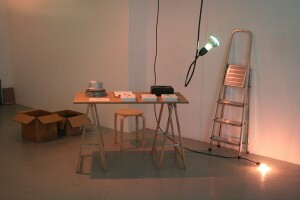 On the floor is a box of hand painted incandescent light bulbs of various colors and forms plus a box of electrical cables with sockets and plugs that work in conjunction with the outlets installed in the ceiling and the hand painted light bulbs. 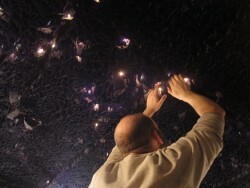 During the opening of the show the artist uses these materials to execute a dynamic lighting situation. 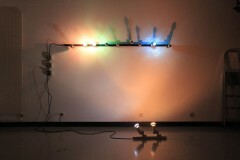 Following a script, he manipulates the lamps and creates varying arrangements of color, intensity, focus, direction, and position. 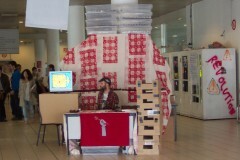 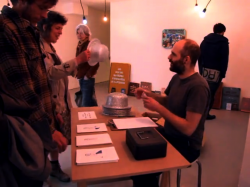 The artist also sits behind a small stand offering visitors to buy a copy of Light Requisite for an Electric Stage in the form of a cheap plastic silver-glitter hats. 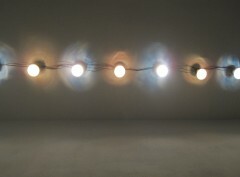 The title given to the sparkle-hat is referencing the kinetic light sculpture by Laszlo Moholy-Nagy of the same name built between 1922 and 1930. 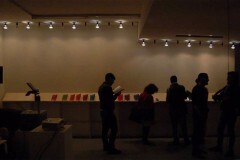 In this installation the kinetic sculpture of Moholy-Nagy is replaced by the cheap plastic sparkle hats, and Moholy-Nagy’s lighting effects -- executed by programable relay switches and machines -- are instead executed with the action of the body of the artist and the bodies of the visitors in the gallery. 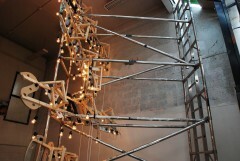 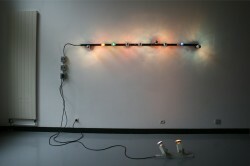 Part lecture and part installation, This work highlights the aesthetic variations of incandescent lighting technology. 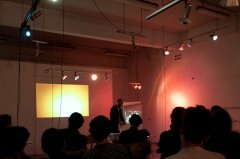 The lecture happens under a scenography of colorful gallery track lighting activated in a theatrical way. 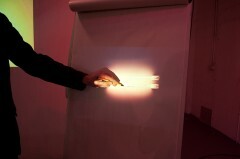 The abrupt lighting changes occur in contrast to the rhythm of the lecture. 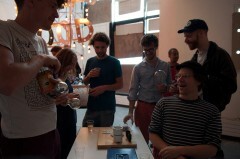 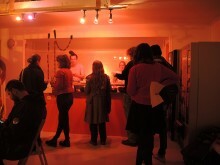 After the lecture, the public is invited to have a glass of champaign in a fictitious light bulb store, celebrating a “Grand Opening”. 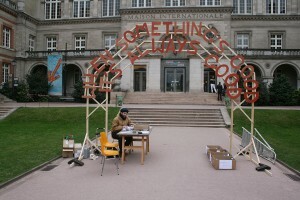 A gigantic wooden sculpture “When Something’s Good, It’s Always Good,” is again used. 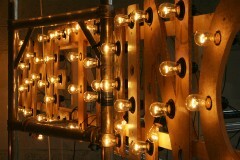 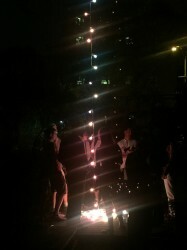 This time the sculpture is re-built in a larger scale and light bulbs are added. 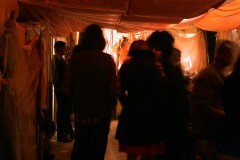 Blaring carnivalesque music fills the room. 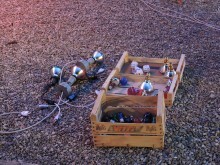 Just below the sign, is a big bin displaying the light bulbs for sale. 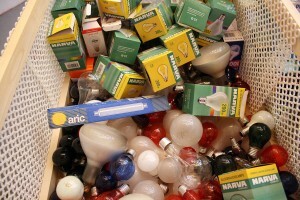 People are invited to select light bulbs from the bin and present them to the light bulb salesman. 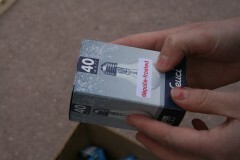 After observing how each light bulb works in the light bulb tester, the customer can then buy the light bulb for less then its market value. 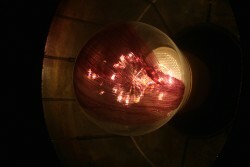 During the conception of this work, the ban on incandescent light bulbs in Europe had already started. 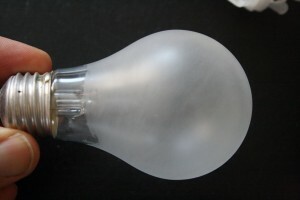 Notably all frosted incandescent light bulbs had been taken out of production and off the market. 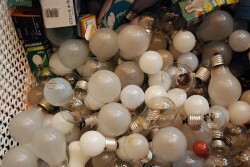 Over the course of an afternoon, hundreds of light bulbs are given away and countless engaged conversations are had with various people passing by on topics ranging from economy, ecology, aesthetics, health, nuclear energy, globalization, consumer freedom, and planned obsolescence. 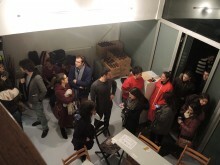 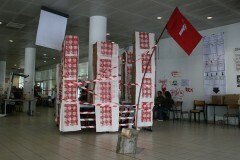 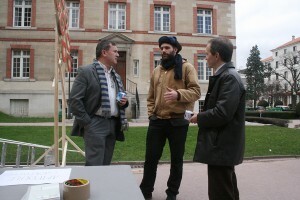 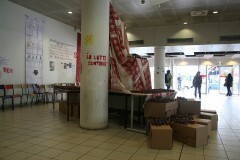 At the art school of Cergy, arrangements are made to have the school cafeteria closed, and a competing cafeteria is made in one of the gallery spaces. 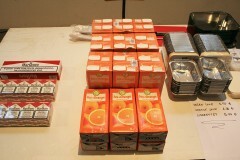 The new cafeteria sells vegan soup, cartons of orange juice, and boxes of cigarettes at below market value. 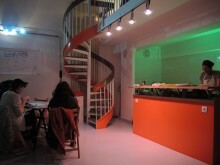 The workers of this new business are all foreigners and only communicate in their native languages (German and Spanish). 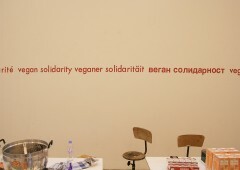 Big wall text in red letters spells out “vegan solidarity” in English, German, French, and Russian. 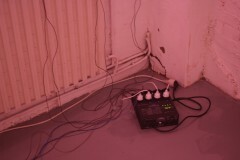 Across from the big pot of soup, a small radio dangling from a nail in the wall plays a song of the Béruriers Noirs (French Anarchist- Punk group from the early 1980’s) in a never ending loop. 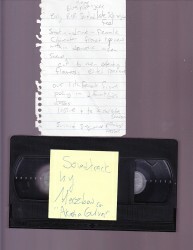 Close to the radio, a piece of A4 paper is glued to the wall with a text from an interview with Theodor Adorno on politically engaged popular music. 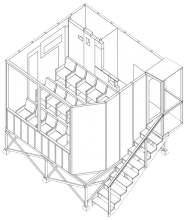 This project uses the cupcake, an iconic American dessert item turned vegan, as an instigator for staging transformations of space and accessibility. 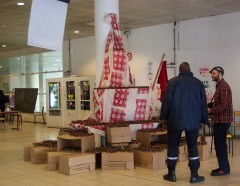 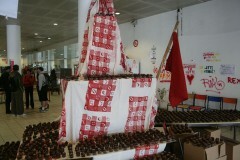 On the first day of the installation, a pyramid is erected to display over 1,000 vegan cupcakes, and people are invited to eat the cupcakes, self-service. 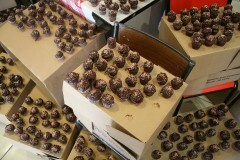 But some people are aggressive and greedy taking too many cupcakes. 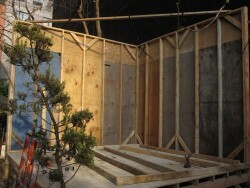 On the second day, a new system featuring a wall and an administrative desk is constructed. 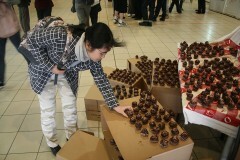 Another 1,000 cupcakes arrive. 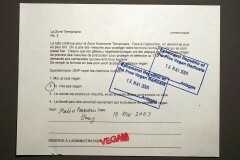 To get a cupcake, one must fill out a simple form answering: “veganism: define.” All forms are validated no matter what the answer is. 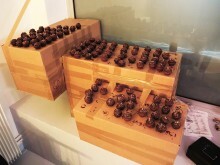 One form grants the right to one cupcake. 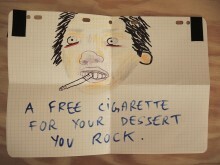 Some people do not like this and cupcakes are stolen. 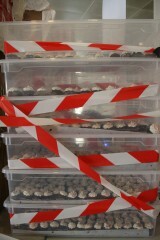 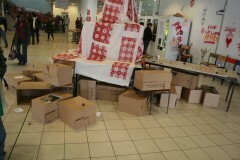 For the third day, a “chateau fort” is constructed to protect a new set of approximately 1,000 vegan cupcakes. 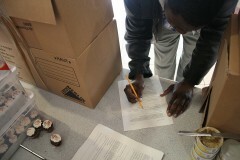 In order to eat a cupcake, one has to make an application for a cupcake. 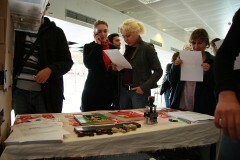 All applications are evaluated and judged individually. 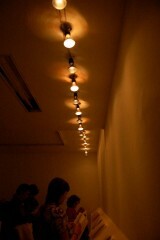 However the protocols of judgment change suddenly and without warning. 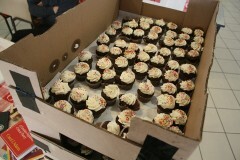 A validated application grants access to one or more cupcakes. 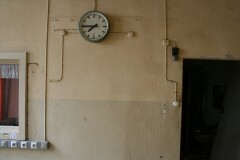 The building was not open to the public, and each day we illicitly gained entry through a series of tunnels under the adjacent elevated train tracks. 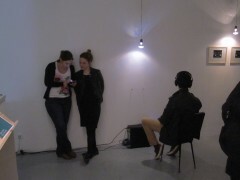 Our audience consisted of a team of security guards of whom we carefully avoided. 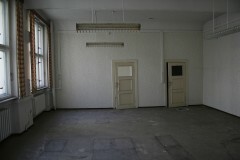 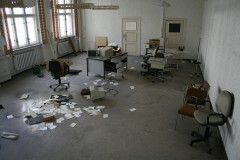 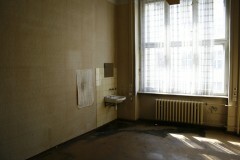 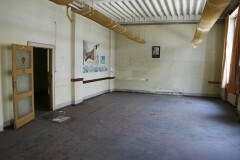 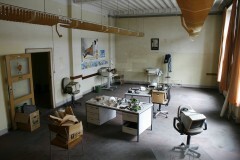 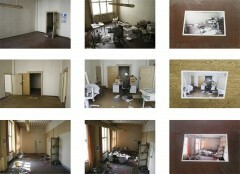 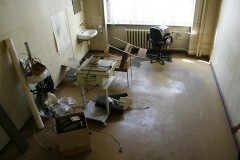 We photographed the rooms as they were: empty, then full, then empty again. 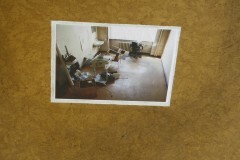 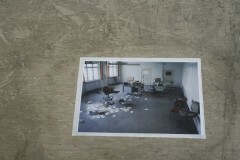 Next in each empty room that the office objects had passed through, we pasted a photo on the floor depicting the same room, but full of the office furnishings and objects.